There is nothing better than seeing kids loving to learn. Marcy and I had the best time watching our mini scientists the other day as they discovered new things. We even heard these little ones use the word hypothesis to one another. How cute is that? I think it warmed my heart even more to see two little girls dressed up as scientists and really enjoying the subject. A field of study that has been dominated by men for centuries, is open to many possibilities for these little girls now. They had a great time learning about solids and liquids, and even making spooky slime that tested the limits of these two states of matter. Many of you have made slime, sometimes called Oobleck, in your class or even at home. It was a fun twist to tie it in to Halloween! On Friday we will launch our Halloween Mad About Science kit with this activity and more! 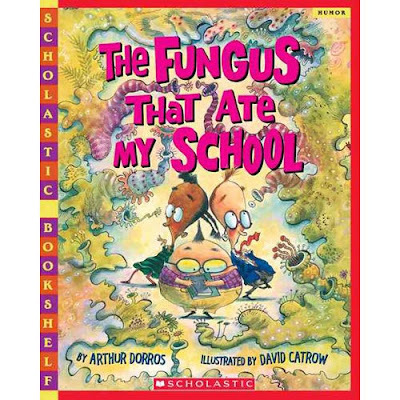 A great way to extend this science lesson is to read The Fungus That Ate My School by Arthur Dorros. The humorous tale of a relentless fungus that takes over an elementary school will leave your mini scientists giggling. The book is full of onomatopoeias, great dialogue, and vivid pictures. After making some spooky slime with your kids encourage them to write about this concoction taking over their school. They can draw pictures or write a creative story. Visit us on Friday for a chance to win a Mad About Science kit which includes this experiment, reflection prompts, and more. It's going to be frighteningly fun!